I recently attended a food bloggers’ night out (organized by Tim) at BellyGood, Sunway Mentari. I was late, so I missed the appetizers (no pictures). I did however, get to try a bite of the Baked Portobello Mushrooms with Bacon and Cheese and Chilli Munchies. While the mushrooms were juicy, the bacon and cheese topping was hard and chewy. The Chilli Munchies (jumbo sausages sautéed with onion, garlic and chilli) was too salty, spicy and peppery – I couldn’t taste the sausages. 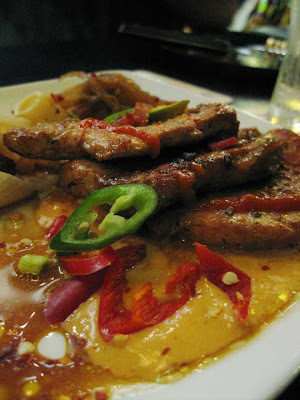 The Pork Tenderloin with Creamy Mustard Sauce and Pork Tenderloin with Creamy Hot Sauce are BellyGood’s latest addition to the menu. Both were served with cold penne with pear & caramelised onions. I found the creamy mustard sauce too bland, and it did not lend much flavour to the tenderloin. The spicy mustard on the other hand was too spicy, overpowering the meat. I also thought the tenderloin was slightly on the tough side. The Mixed Platter offers both the pork belly and ribs (something you should order if you want the best of both worlds). 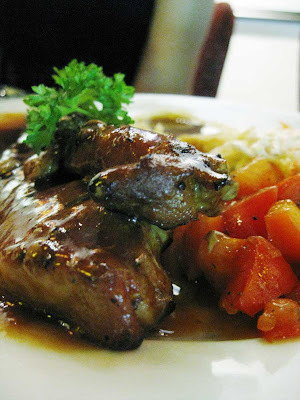 The pork ribs were surprisingly meaty and tender, without falling into pieces. Tastewise, I found it slightly on the sweet side. I would have preferred the mash potato to be more buttery, this was a tad bland. 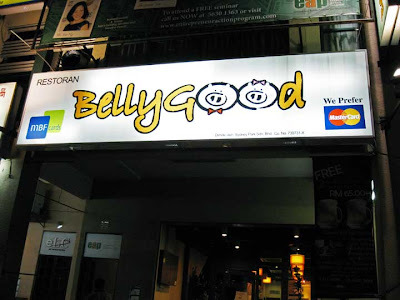 The Original Grilled Pork belly was definitely BellyGood’s forte. Marinated in a sweet sauce, the perfectly tender and fatty meat could almost melt in your mouth. 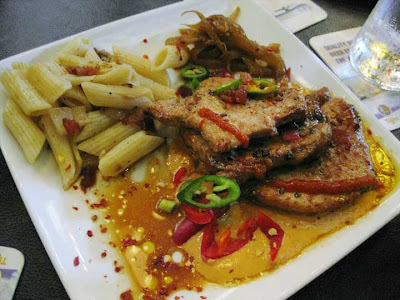 According to the owner, the meat gets its flavour from the 24-hour marinating process in BG’s secret sauces. 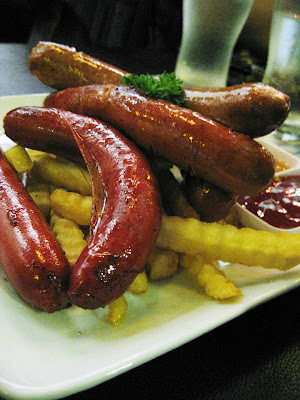 BellyGood’s Sausage Platter had 5 types of sausage (pork chorizo, chicken chorizo, pork oriental, pork oriental garlic and spicy Hungarian) with a side of fries and Thai chilli sauce. The chorizos had a tangy, smoky flavour. I liked the Hungarian Spicy sausage – mildly spicy and uniquely flavoured with paprika and spices. 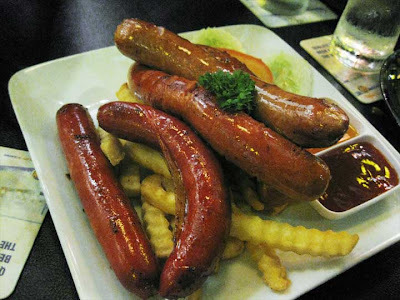 The Oriental sausage reminded me of the lap cheong (Chinese sausage). I personally love lap cheong, so this was another favourite. The Sautéed Bacon Capellini was served last. 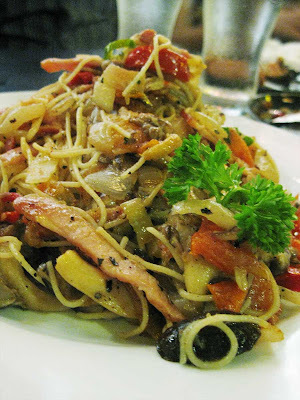 The angel hair pasta was tossed with bacon bits, mushrooms, chopped chillies, tomatoes, fresh herbs and garlic wine sauce. Great for those who like their pastas simple. We ordered the Chocolate Brownie with Vanilla Ice-Cream and Tiramisu for dessert. This was not included in the meal, so Josh graciously paid for it. Thanks Josh! 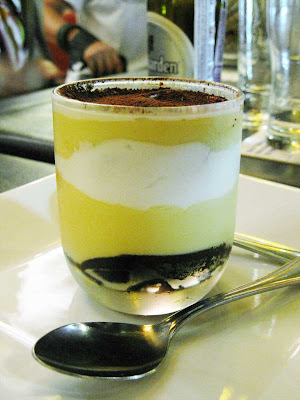 Instead of mascarpone cheese, I detected only custard and cream in this “Pick Me Up”. There was no liquor-soaked sponge basep; we got a hard, rock-like base that was difficult to eat. I found the chocolate Brownie with Vanilla Ice-Cream mediocre. The brownie was too hard and dry. Luckily, the ice-cream made it easier to eat. The company was great. I got to meet Simon and thenomadGourmand too! Almost made it there last night, well maybe the next opportunity will be round the corner, pork belly and sausages, pork belly and sausages, pork belly and sausages, pork belly and sausages…..till then. yes i remember the pork belly being dmn good..the ribs abit dry but meaty..
i see diff pork items as well..hmmm time to go visit them..
hmm, didnt expect such mixed reviews. anyway, thought the Movenpick (was it?) 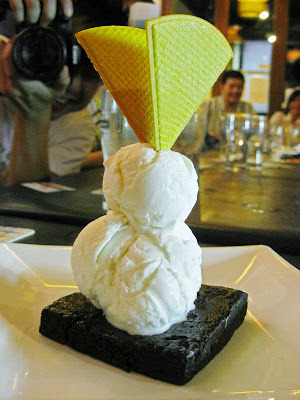 ice-cream + brownie combo’s deadly. the tenderloin is the most coarse and bland meat of the pig. Oriental sausage looks red-is it because of too much nitrates? foodbin – That explains it! =P Too much nitrates? Dunno wor…I only know it’s nice to eat! their pork ribs are great too!!! Can’t have enough of it… since I can’t eat beef or lamb… pork is the next best thing!!! ahhah agree to ur tastebuds! leo – How come cannot eat beef or lamb? Cannot take the taste or religion? Sweat ah, I still have loads of backlog ah!!!! I think your post is one of the frist one. I’ve not found the time to load and edit my pictures. =( Shall make it my targetto complete it by end of this month. I believe what you ate wasnt the tenderloin coz if it was, there wouldnt be complaints about the meat being tough. what you had was the loin. 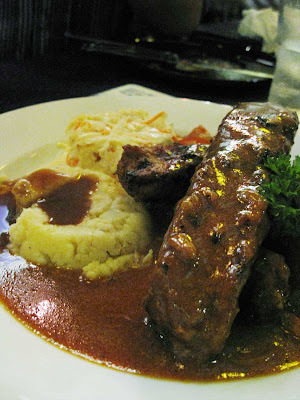 loin is often NOT a choice of malaysians but choice meat for westerners. 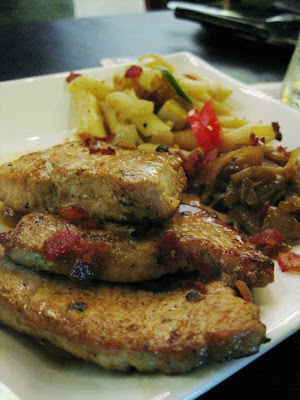 malaysians barely accept pork chops unless tenderizers are used.